Its unique victorian pendant set. Studded with semi- precious stones. - Victorian Pendent with Uncut Diamonds. Various colors are available in this product, also it can be customized as per customer requirement. Dull Victorian pendant set with coral painted stone and turquoise drops in coral and turquoise string. Your search of ethnic Victorian Pendant Set ends at "Jewellery Design India", as we provide the quality Designer Jewellery. Our Victorian Set has a graceful blend of tradition and style. 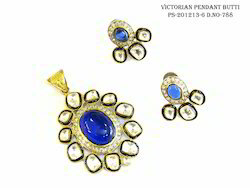 Product code : jpvsa101 product name : victorian pendant set vsa101 price : $ 64. 77 weight : 0. 00 gm description : victorian pendant set in cz made by silver and bronze combination metals. 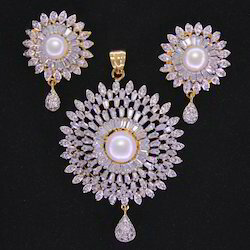 Madhav gems & jewellers is a perfect destination for well- designed victorian pendant sets. The company has carved a niche as one of the promising victorian pendant set manufacturers and suppliers in the country. Designed to perfection, our designer collection of victorian pendant sets is made with silver and gold.